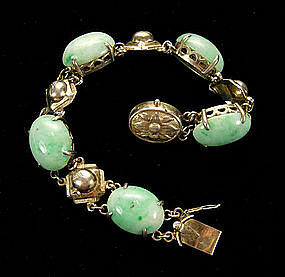 Lovely sterling bracelet with very large apple jade stones. Circa 1900. Marked S, for sterling silver. With a light gold wash. Decorated with finely detailed repousse designs depicting stylized flower forms. With a slide clasp and safety catch. An excellent piece to wear alone or to layer with other jade bracelets. 7 inches wearable length by 1/2 inch wide by 3/8 inch deep. Excellent condition. Photos enlarged to show detail.